The Alkalol Company has been providing sinus health solutions for cold, flu, and allergy symptoms since 1896. Created by James P. Whitters, a New England pharmacist, Alkalol has been trusted by doctors and allergists for over a century. When mucus builds and clogs nasal and sinus passages, it can be hard to breathe. 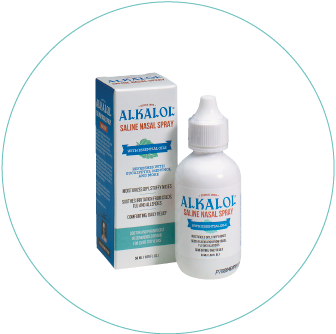 Alkalol Nasal Wash – the only saline rinse with a proprietary blend of natural extracts and essential oils Since 1896 – provides invigorating relief from nasal congestion and sinus pressure caused by colds, flu, and allergies. Alkalol is a safe, fast-acting, and refreshingly-strong solution that leaves your sinuses feeling clean and revitalized. 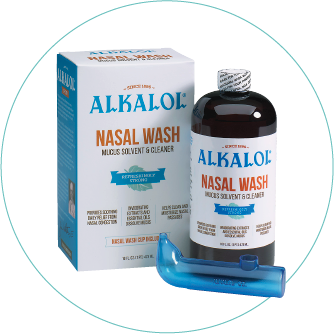 Alkalol Nasal Wash is real relief you can feel. With its select blend of natural extracts and essential oils, Alkalol provides an invigorating sinus rinsing experience regular saline solutions can’t match. Alkalol’s unique ingredients, including eucalyptus, menthol, and wintergreen, help dissolve mucus, reduce nasal congestion to help you breath better quicker. Mucus just met its match! Our new Alkalol Saline Nasal Spray utilizes the same mucus-busting blend of natural extracts and essential oils in a new, refreshing formula specifically designed to provide fast, convenient relief for dry, irritated, and clogged nasal passages caused by colds, flu, and allergies. Alkalol Saline Nasal Spray’s unique formula is cooling, soothing, and refreshing and it’s the only saline nasal mist with Alkalol’s time-tested proprietary blend of natural extacts and essential oils that work to dissolve mucus and provide soothing, daily relief for dry, stuffy noses. 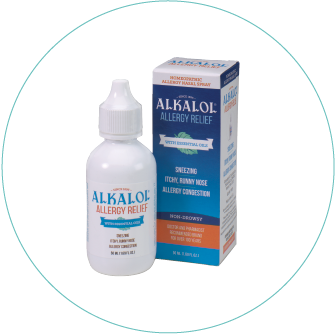 Alkalol Allergy Relief is our brand-new homeopathic nasal spray that temporarily relieves common seasonal and environmental allergy symptoms, including sneezing, runny nose, itching, dryness, and nasal congestion. Available exclusively at CVS Pharmacy, Alkalol Allergy Relief soothes and refreshes with our handpicked blend of essential oils, while providing the gentle, safe, and stimulant-free homeopathic relief you need to breath better and stay active this allergy season.